It’s that time of year – we’re trading out our skis for mountain bikes and snowshoes for golf clubs. Spring break is right around the corner. If you’re looking for a way to celebrate the warmer season, Chandler, Arizona, is the perfect spot for an outdoor adventure. For the ultimate spring break, try out one – or all – of these experiences. The Dinosaur Mountain course at Gold Canyon Golf Resort is a surefire way to make your spring break an unforgettable one. Set in rolling desert scenery, you get to experience the best of Arizona golfing – and trust us, you’ll be glad you did. Dramatic elevation changes make for a challenging course, but if you’re up for it, it’ll be one of the best rounds you’ll ever play. It’s a popular spot, so be sure to schedule your tee time in advance! There is nothing like seeing Arizona from the sky. This spring, tandem paraglide or power paraglide in some of the best locations in the country. South Mountain is connected to a 13-mile mountain range and is close to Chandler. Here you will foot launch from the largest municipal park in the world and soar over southern Phoenix. 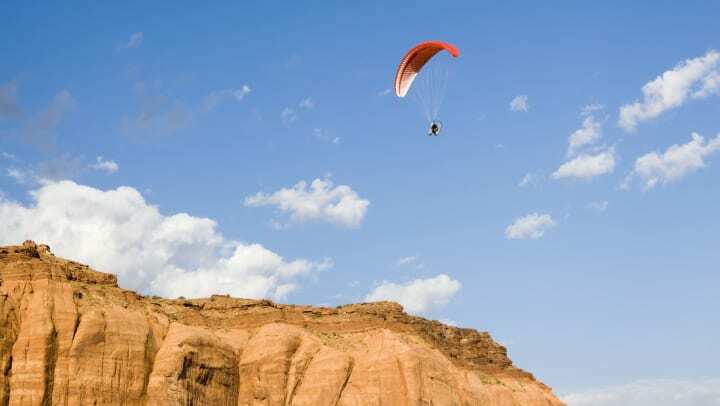 You can also check out Shaw Butte, which lands in the heart of Phoenix and has been known for its crazy paragliding views since the early 1970s. From up in the skies, down to rugged backcountry – it’s time to experience the Arizona desert firsthand. Head east to the Sonoran Desert where some of the area’s best trails take you through the Bradshaw Mountains and across the Agua Fria River. Rent a few ATVs and create your own journey, or opt for a one-of-a-kind guided tour – regardless, there is nothing like an exhilarating day of off-roading in the desert terrain. Less than 40 miles from Chandler is a paddleboarder’s paradise. Saguaro Lake is one of Phoenix’s most popular spots – and for good reason. With over 22 miles of shoreline, there is a ton of room to explore. Wake up early to catch the sunrise from the water, or time it right and go for a paddle under a full moon. When you get hungry, there are plenty of spots for picnicking, or you can paddle right up to the Lakeshore Restaurant. While you’re off enjoying spring break around Chandler, Arizona, we’re here for your gear. Whatever your storage situation, we have your back. Give us a call today to see how StorQuest can be your reliable self storage partner.